Discovering Artists calls Washington DC native, Leah Morgan, “an artist to watch. Her feminine voice and intoxicating melodies are sure to grab the attention of many, and respect of even more.” With favorable comparisons to artists like Aimee Mann, Ben Folds, and Lisa Loeb, Leah continues to amass a loyal following whether fronting her 5-piece band or performing solo on alternating piano and guitar. Leah has shared her captivating voice and engaging, witty delivery at The Barns of Wolf Trap, The Kennedy Center, Iota Club & Café, and Jammin’ Java, and appearing with national touring artists, David Wilcox, Terry Hendrix, Frank Bango, the Brindley Brothers, and Tom Freund. 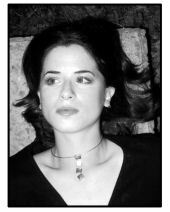 Her debut album, Zero Dollars Spent, reached the 10 top-selling albums at Awarestore.com, and was selected The Washington Post mp3 'Top Pick' and among the "Best Mid-Atlantic Releases of 2003" (Left Off the Dial), as it continues to receive airplay on radio stations throughout the country. Recently, Leah was selected as a winner in the Berkeley Park Records Original Song Competition, sponsored by a Los Angeles-based record label. The band is Leah Morgan on vocals/piano/guitar, Tom Hnatow (of Otis Finch and Viki Nova) on lead guitar, Paul Frields on bass guitar (past work with Danny Blitz, Steve McWilliams, Jenny Boyle, among others), Okorie Johnson on cello (India Arie, Doria Roberts, Jennifer Daniels, Marathon, and Shana Alverson) and Rich Nagel, (Sean Michael Dargen, Ice Boxers, Steve McWilliams, and Jenny Boyle) on drums. The band will be bringing their exceptional performance this fall to The Bitter End (NY), the Grape Street Pub (Philly), Hotel Café (LA), and many others, as they continue to bring their distinct brand of music to an ever-growing, widespread and diverse audience.